Readers of this blog will know that I have a keen interest in video as well as stills. One of the most frequent questions on asked is what rig do I use, three people asked me last week alone. The truth is I do not yet have a rig, but I am in the process of choosing one right now. I will share that process with you but it was heavily influenced by Rodney Charters DP of '24' and many other productions too. So how have I managed to not buy rig for my DSLR for so long? After all it is a less than ideal form factor when it comes to handheld video shooting. To see what is on the rear LCD you have to hold the camera at 'half' arms length, this in turn means you loose stability and you truly cannot see if the image is in focus and one does tend to shoot more wide open when shooting video on a camera like a Canon 5D MkII. When I started using the Zacuto Z finder, which clips onto the rear LCD, I could see what was sharp and what wasn't. It was a giant leap forward in my video work. But the really significant factor about using a Z finder is that the camera comes back to your eye and you gain what any video shooter craves. When I shoot with my Z finder it gives me back the magical three points of contact between then camera and my body. So all of a sudden a rig was not quite such a priority. 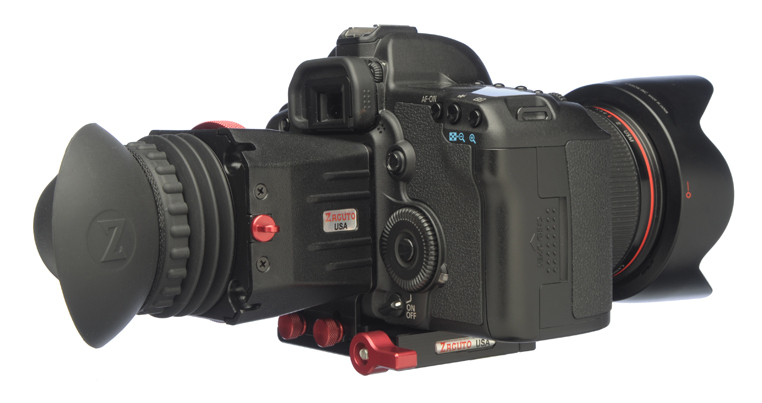 There are similar products out there, but I am consistently impressed by the superb build quality of the Z finder and for that matter all other Zacuto products. I have dropped mine more than once will no ill effects. If you are looking for the first 'building block' on your video journey which gives the biggest bang for you buck, look no further. I don't agree, the first thing u should buy is a way to get better audio, something like a microphone or an audiorecorder. Bad sound is even worse than bad video. Thanks for the valid comment. Audio truly is 'Cinderella' and is unwisely down the list of priorities for many when it comes to shooting video with a DSLR. So indeed it is arguable that audio should be the first port of call, but for me the very first images from my 5d mkII gave me a real taste for video, at the stage, knowing it was sharp and steady meant a lot to me. Shameful goings on with the iPad mini.